We went apple picking 2 days ago - to a different farm (Shelburne Farm) this time. It was a family outing through my husband's workplace. It's never a bad idea to check out other farms, and this one is closer and was pretty nice. We came home with a half-bushel of Empires and Cortlands and I promptly took a nap because I was working overnight. Also this morning I started a new batch of yogurt. It'll be done this evening when I get home from work. Really, I think I have maybe 8 empty jars left. 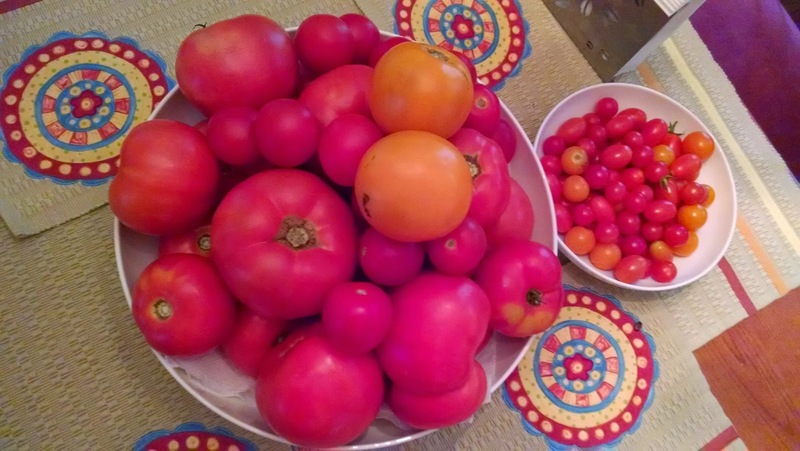 This morning I made a batch of garden salsa, finishing off the tomatoes and scallions at least. Still have a whole lot of peppers. Also in the fridge: leeks, a bulb of fennel, dill, cilantro, parsley, mustard greens, arugula, beets, turnips, hot peppers, bok choi, carrots, cabbage, and kohlrabi. The less perishable things are in baskets: potatoes, onions, garlic, tomatillos, spaghetti squash (2), 1 acorn and 1 carnival squash. The batch started with 3 pints of chopped tomatoes and this made about 7 cups of salsa, 3 pints were canned and the rest is in the fridge. You should see my fridge. Not only is the vegetable drawer stuffed with produce, the bottom 2 shelves are stuffed as well. AND there is more in a basket on the table - all the squashes and potatoes and tomatillos. Today I made another triple batch of eggplant caponata which came to 7 pints. This is now in my gift stash. A friend moved to a house that used to have a vineyard attached and has a lot of residual grape vines - Zinfandel and Concord, mostly. Those Concord grapes were so sweet! We brought home a bunch over the weekend and I've extracted almost 2 quarts of juice. Later today I plan to heat it up, add sugar, and then put it back in the fridge for the kids to drink. Grape juice is a bit of a novelty, since usually I don't buy juice. Tonight for dinner I am going to make a soup with the head of escarole I got from the farm. That'll be something new for us, and it'd be nice to eat some of the greens instead of giving it all to the bunny! After making a batch each of raspberry jam and syrup, I'd wanted to go back and get enough berries for one more batch of jam. We always seem to run out of it faster than anything else and, since 2 jars go to the fair, I was already down. Today was the day I'd set aside for this; my timing couldn't have been better! The berries were terrific. I was able to fill my bucket, which holds 5 pints, in half a row and about 30 minutes. After paying for them and putting them in berry baskets, I went back and picked one more quart. That was just the right amount as 3 quarts makes one batch of seedless jam and now we have some for eating! Last weekend, we went to the beach and flew kites for a while. It was a perfect almost-Fall day, at least before it started to rain. At least we were off the beach by then. 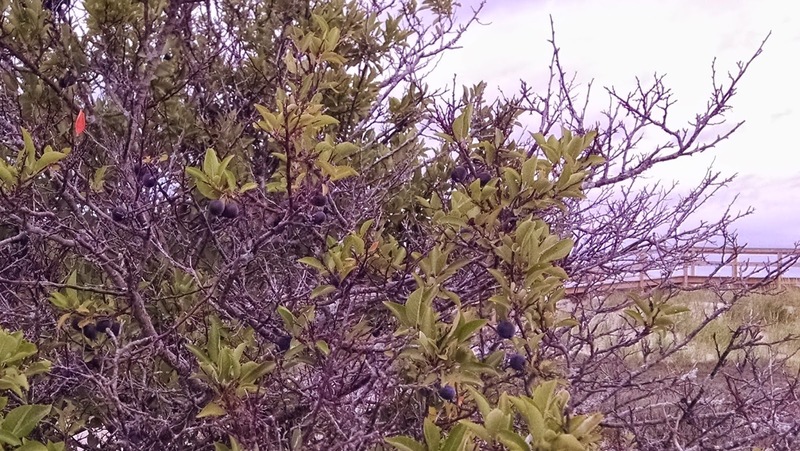 However, I noticed a fruit I'd never seen before and, after a minute, realized they had to be beach plums. I took a little taste to confirm my suspicions and then, over the course of the afternoon, picked a few. Half a pound, to be exact. Clearly, this isn't enough to make a full batch of anything. I put them in the freezer and thought about them for a few days and found I could make half a batch of jelly. Today, that's sort of what I did. Here's what I know: it would have been smarter to pit them like cherries and then just make jam. I boiled them with a little water and ran them through the food mill instead. What happened? Well the pits were too small and jammed the mill, so eventually I had to take the whole thing apart and then simmer the pits and pulp again. This was strained and then I took out the pits by hand and put the pulp back into the pot. When I had 2.25 cups of liquid and pulp I added half a package of powdered pectin and 3.25 cups of sugar. This made 4 8-ounce jars of jam and a little leftover. One of those jars of tomatoes from the other day didn't seal so I put it in the fridge until I could get to the next batch of caponata. Today's batch differs in that I had no celery or green olives so I used extra Kalamata olives and peppers instead. This finishes off the eggplant and bell peppers I've had in the fridge from the farm. This batch is going into eight 8-ounce jars so I can add to my gift stash, as it's time to really get moving on the holidays! First thing I did this morning, though, was make a batch of yogurt. I have discovered I like using yogurt from Green Mountain Creamery as a starter and I hadn't had a chance in a while to get to the store that sells it. Now that's resting on the heating pad in the basement and it'll be done after dinner. Something bad happened to the sauerkraut I was making; it seems it didn't make enough liquid from the cabbage and the salt and the top of it got all moldy. Sadly, the only thing to do was to toss it. I suppose I might get more cabbage from the farm but maybe the sauerkraut will have to wait until next year. I only had a few hours between when the kids left for school and I had to leave for work, so I quickly started a batch of Wine Kraut with the 2 heads of cabbage I'd accumulated. They only weighed 3.6 pounds so that meant mixing the cabbage in the crock with 2 T. of salt and tomorrow I'll add 1/3 cup of white wine. Sauerkraut is so easy - you just let it do it's thing and it's happier if you leave it alone! I also took the last of my green beans and made 2 pints of Dilly Beans. Each pint had half a large clove of garlic, a flower head and a sprig of dill, and 3 peppercorns. Even with all this canning and fermenting, I still have a lot of produce left before tomorrow's pick up from the farm. In the fridge: peppers, cucumbers, eggplant, patty pan squashes, carrots, turnips, dill, parsley, and a melon. I guess I'll go cut the melon now so it'll be less to do before breakfast. With all the produce I've gotten in the last week, and not being home for dinner as much as I'd like, I had a plan to get a lot done today. First, though, I had to go to the mall, which took HOURS. Shopping is not my favorite activity, but at least I was mostly shopping for someone else. Since I got home, I have barreled through a half-batch of Salsa Verde (2 cups, and I left the hot pepper seeds in, so this batch is HOT) and a triple batch of Eggplant Caponata. I just pulled 7 pints out of the canner. The tiny little bit that was left in the pot went into tonight's pasta sauce, which also included sautéed eggplant, onions and peppers. 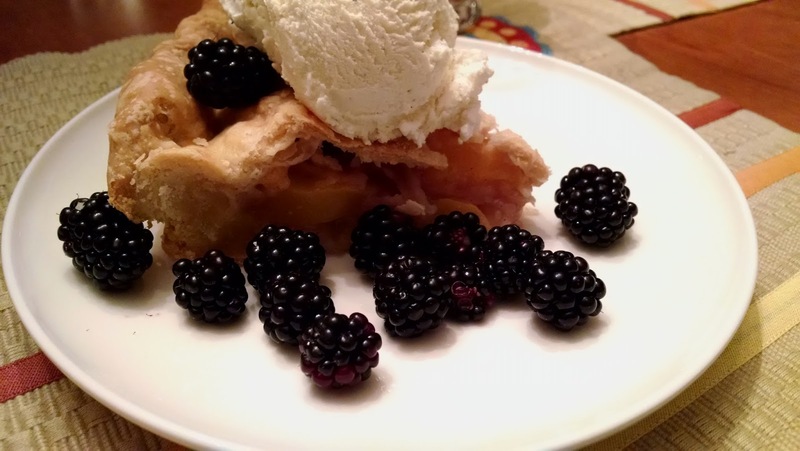 As I said last week, I owed my kids a pie. Today I made a peach pie using 10 small peaches. The crust was mostly Crisco with a little butter. The berries came from the farm share and I thought they would make a nice garnish. I must have been on to something because the 9 year old exclaimed, "Holy smokes! It looks like something they serve at a fancy restaurant!" Wow! The farm share today was HUGE. I had to carry it in 4 tote bags: potatoes, onions, carrots, broccoli, cabbage, tomatoes (LOTS of tomatoes), cherry tomatoes, kohlrabi, eggplant, peppers, hot peppers, parsley, dill, cilantro, tomatillos, blackberries, green beans, kale, turnips, spaghetti squash, watermelon, and then there were the things I skipped this week (flowers, husk cherries, other herbs). After I got all this home and we were eating some of it for dinner, our mason arrived with more tomatoes, eggplant, celery, parsley, long green beans and Bishop Crown peppers. I have a lot to do! Tonight I made a batch of that hot pepper sauce I made last year. I had 22 banana peppers which was about half a batch. This is mixed with yellow mustard, vinegar, sugar and salt and then thickened with flour. After that it is processed for 20 minutes in a boiling water canner. This amount of peppers made 10.5 cups of hot sauce.